Really, I would love if I had one of those front porches all bedecked with ghouls and strobe lights and spiderwebs. I do love the spooky side of Halloween for sure! But mostly my porches are just filled with pumpkins that are brightly colored, summery and sprinkley. I think maybe when my kids get a little older (i.e. I feel like I have more spare time and helping hands for decorating), I’ll attempt the scary route. But for now, these happy little balloons fit right in. And since I got them done before my birthday, they go perfectly with my birthday balloon wreath! 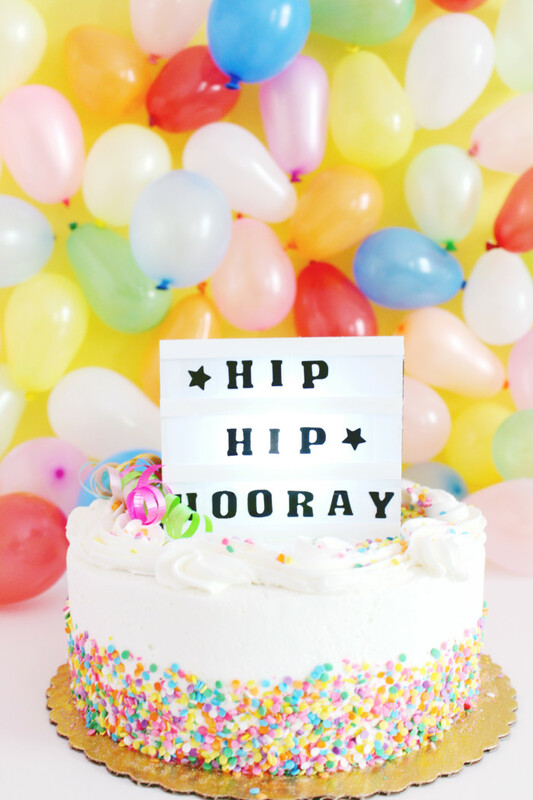 These itty bitty cinema lightboxes are the perfect cake topper because you can make it say whatever you want! 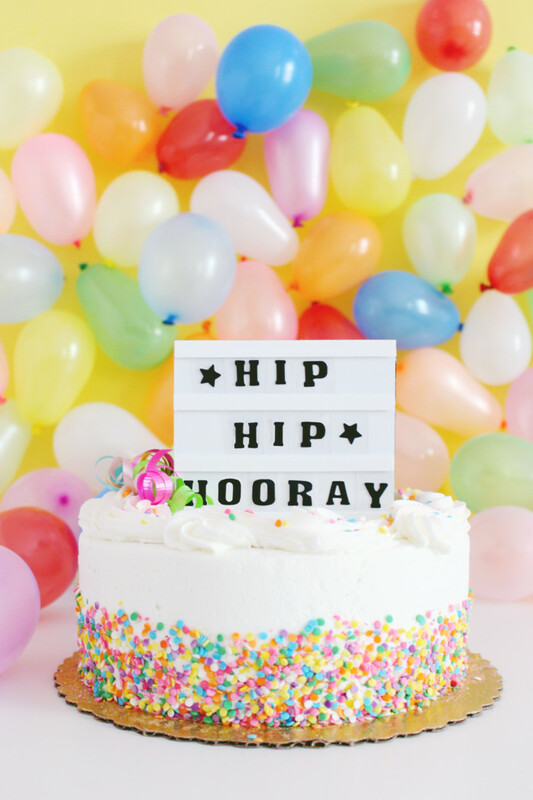 From birthdays to weddings, these little lightbox cake toppers are the perfect fit. Our birthday is on Thursday!! Woohoo!! 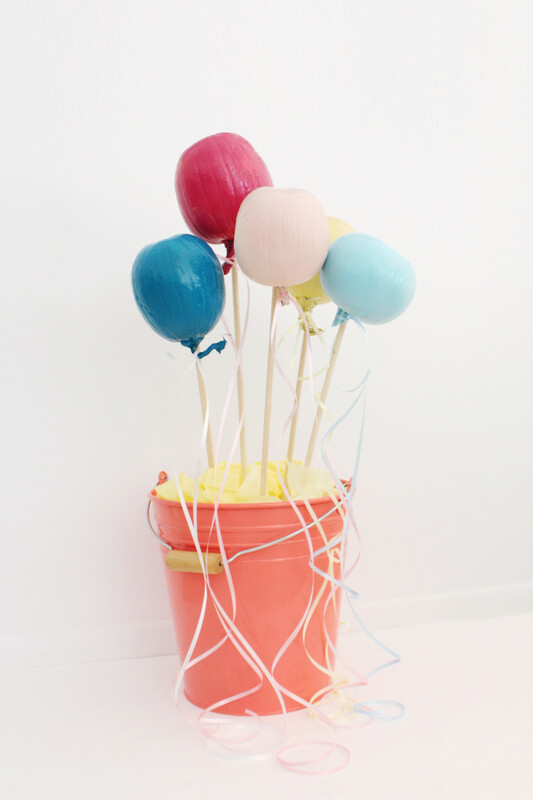 We love to celebrate here on AJR by coming up with some fun birthday-related DIYS. And this one might just be my very favorite one ever!! 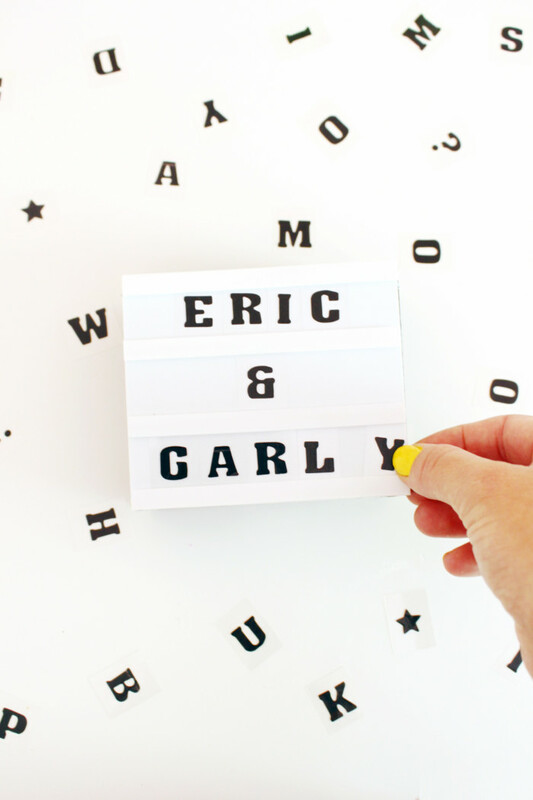 We recently shared a tutorial for making your own light box. 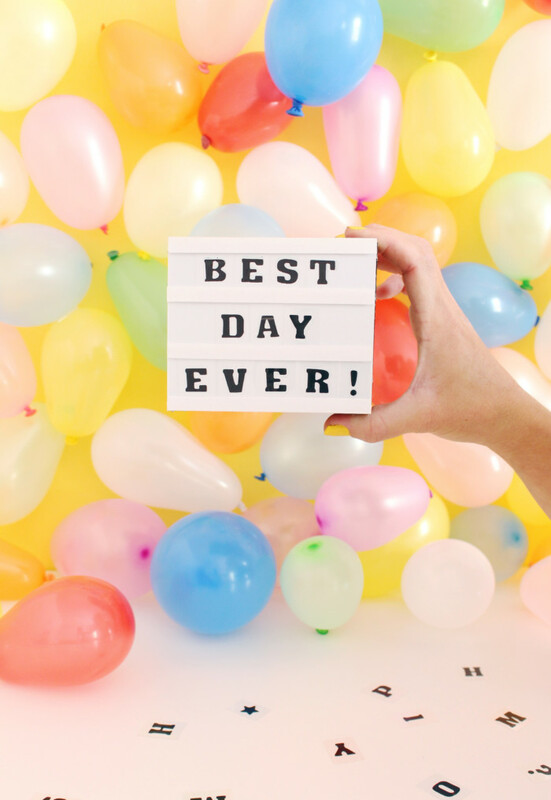 These things have made quite the entrance onto the social media and blog scene this last year. And I have a serious crush on them! When I was whipping up my larger one and had all these materials on hand, I of course thought of doing an even mini-er one. I love tiny things (who doesn’t?) and even though the popular boxes are technically already a mini version of business and cinema signs, I thought we could go even smaller! So I did! And what better place to put an endlessly interchangeable little sign than on top of a cake? 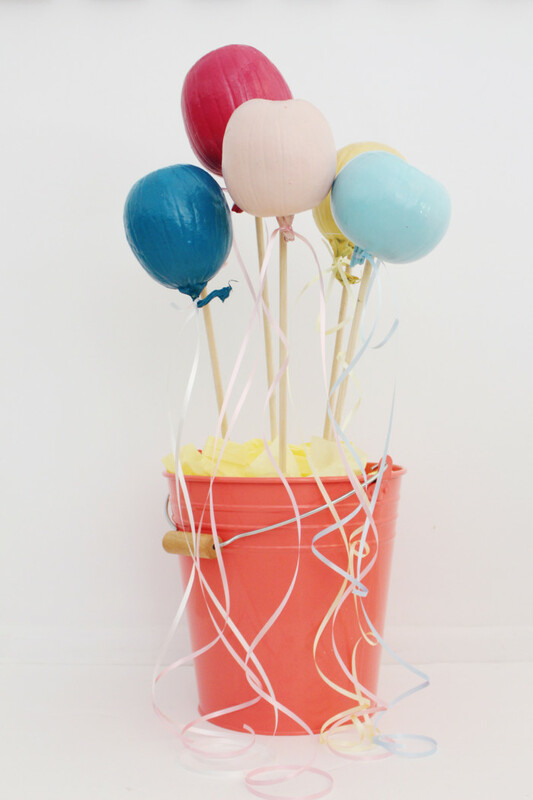 Not only is it a great size for cakes, but it can literally be used for every single occasion ever! Birthdays. Showers. Retirement parties. Graduations. Even weddings! Oh I would LOVE to see one of these on a big, beautiful wedding cake. The great thing about the minimal look is that it goes with every kind of decor or party theme! Not only is this little cutie infinitely customizable, but it also lights up! YAY! 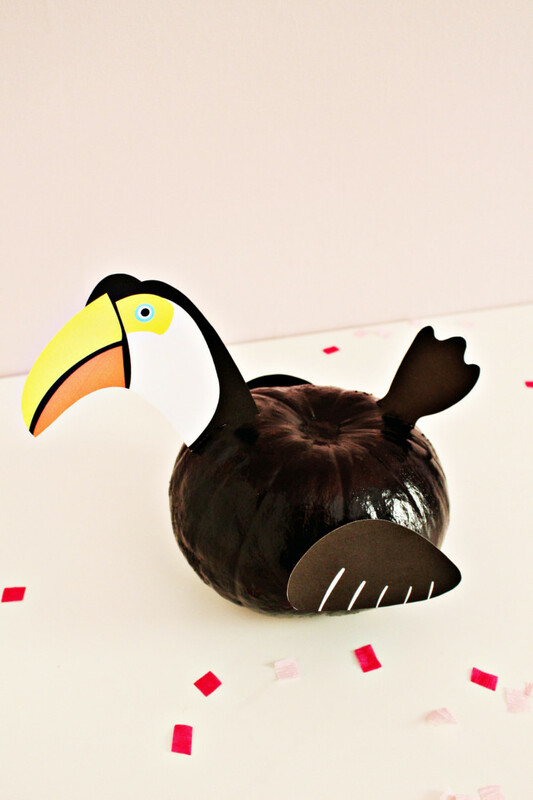 Click through to see how to make the most useful cake topper ever with us! 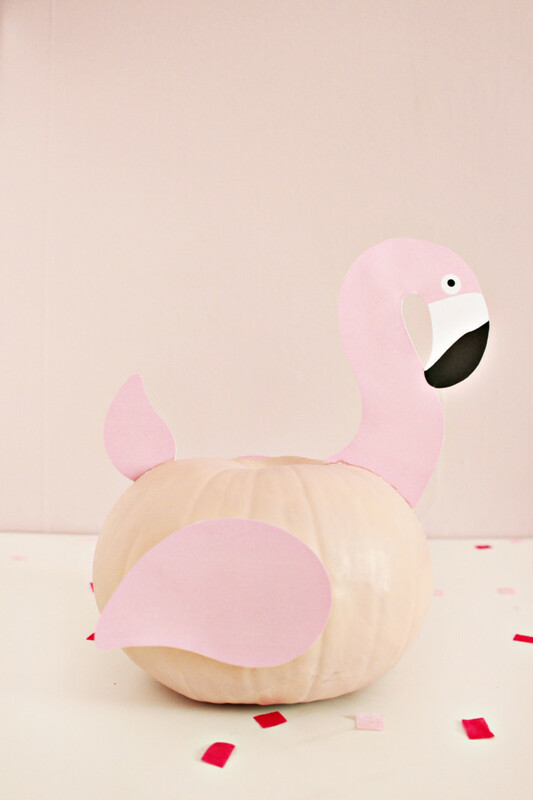 Keep summer vibes goin’ with these DIY no-carve pool float pumpkins! 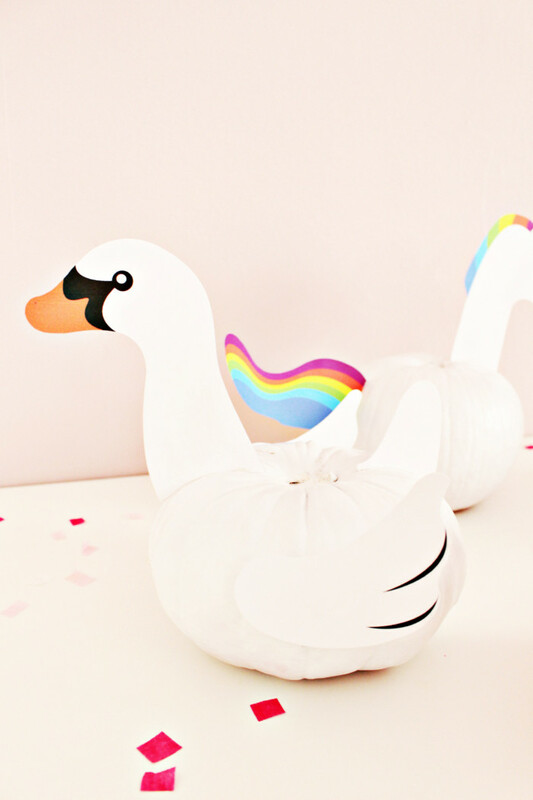 Free printables for swans, flamingos, parrots, toucans and rainbow unicorns included! Sometimes trends just fly right by and that is usually a good thing. But sometimes a fad holds on to its popular crown for several seasons at least. That’s right, I’m talking about the ever-popular pool float! Specifically the ones that are shaped like birds and unicorns. Since I’ve barely stepped in to a pool the last…nine years…(ugh!) I haven’t had an excuse to hop on one of delightful pool pals yet. In Mexico earlier this spring, I almost bought a bomb pop shaped one cus I hadn’t seen one before and my family LOVES bomb pops. But I decided against it since I didn’t really want to pack it home. And aside from that trip, I haven’t spent much time pool side. But! That doesn’t mean I don’t love seeing everybody else on Instagram have the time of their lives on a giant flamingo. Seriously, the flamingo and swan pool floats have been all the rage, on social media at least, for the last two summers. And, as someone who loves nothing more than the gentle rocking sensation of floating on water, I can see why! Not only that, they are so super cute. Even as someone who is pretty much over the flamingo craze, I don’t hate the inflatable ones one bit. This year we even saw a few new pals enter the scene: the rainbow unicorn, the toucan, the parrot, and all-new swan colors! 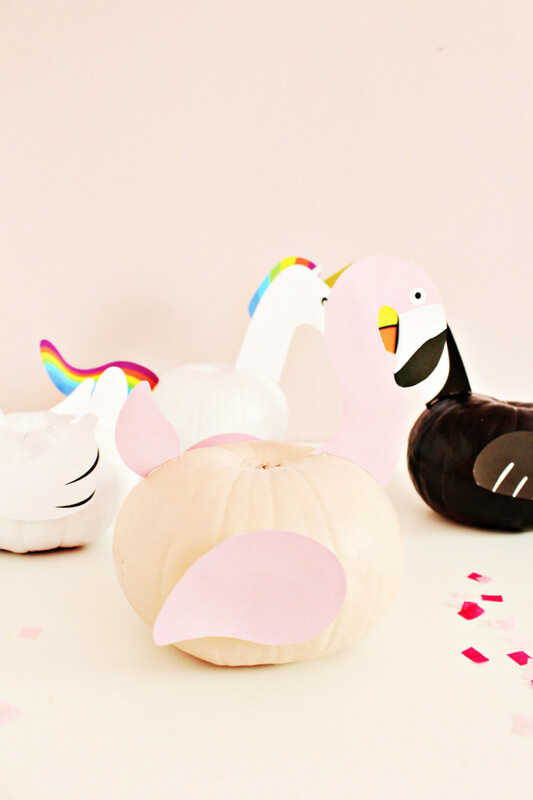 Regardless, you really can’t go wrong with a flamingo, a swan, a toucan and a rainbow unicorn now can you? Nope. Nope you cannot. 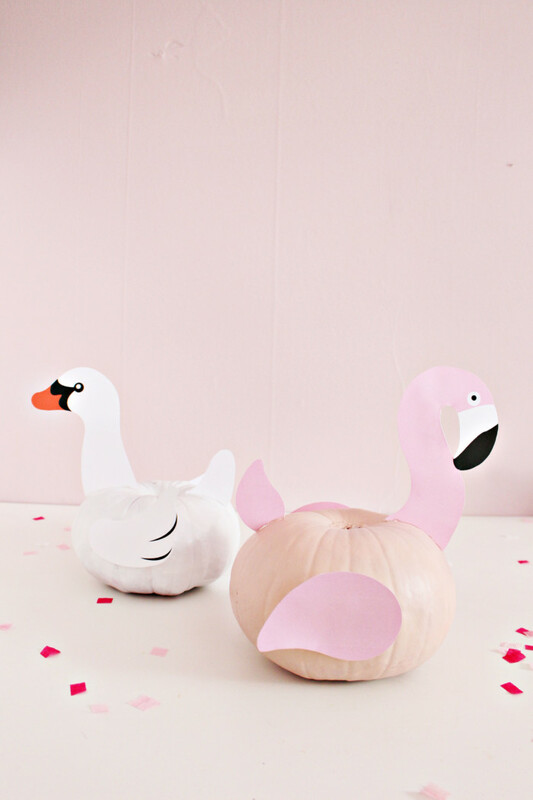 I only made those four for this post but I also whipped up the printables for a gold swan, a black swan, and a parrot. I wanted to make them all! But I searched through all the pumpkins at two stores and there just isn’t a great variety yet. I took all four of the ones I could find that were similar in size and had the flatness I was going for. 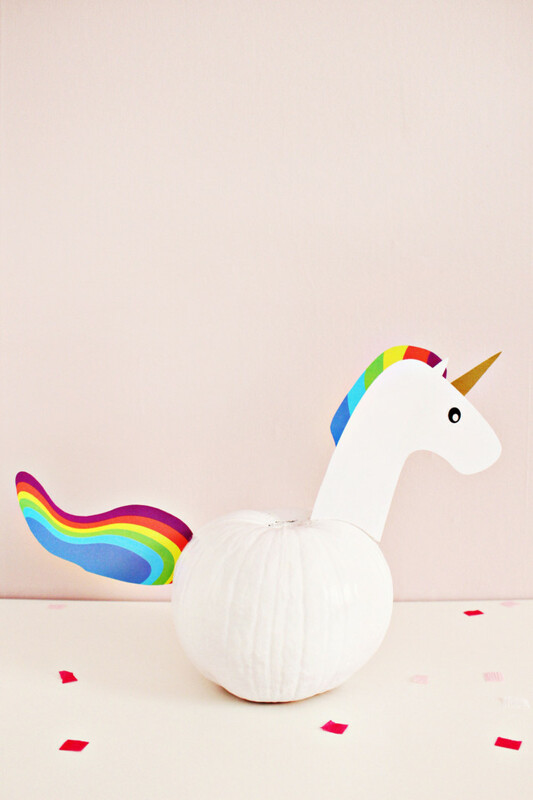 Assuming that you’ll be making your pumpkins closer to Halloween, I’m betting you’ll have better luck! 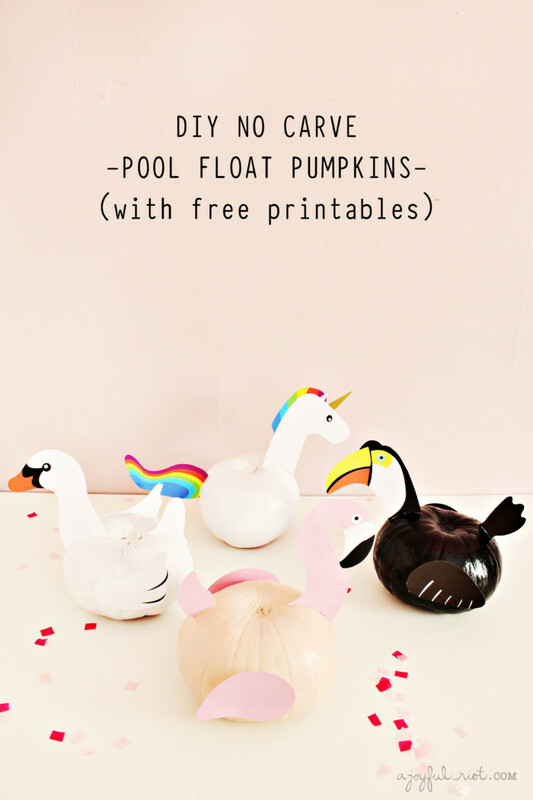 But you probably won’t need more than four pool float pumpkins either will you? haha! Use your favorite cupcake recipe as the base for these fancy-but-easy cakes. 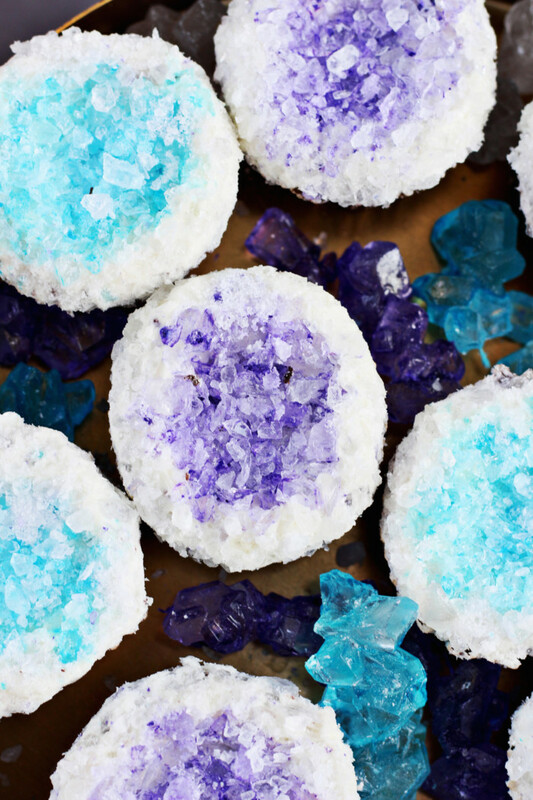 Then top with simple rock candy to create edible faux geodes, reminiscent of one of the prettiest rocks out there! 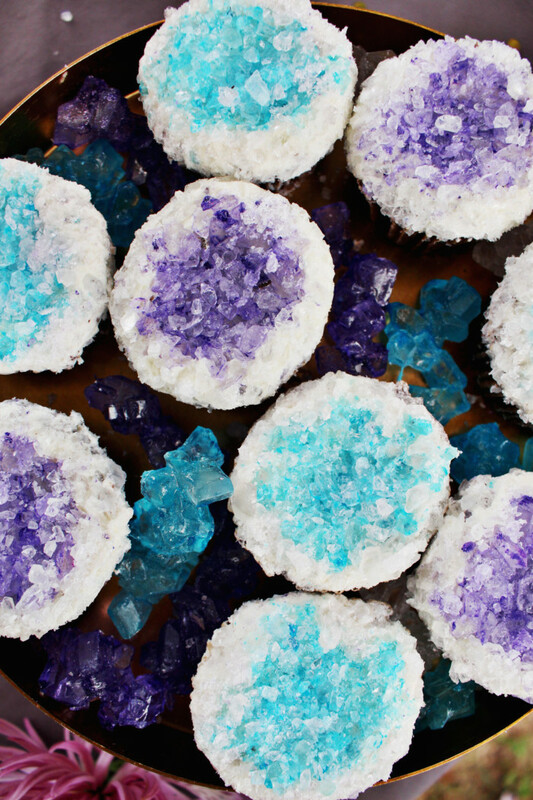 Umm have you seen geode wedding cakes?? Gah! Go look on Pinterest! They are like. A word beyond amazing whatever that is. They are so pretty. I stumbled upon them a couple of months ago and was just so smitten! I know there is no way I could even begin to hope of making something like that. I did take some beginner cake decorating classes years ago but I never went beyond that. I definitely never perfected buttercream or fondant. And you know what? I actually don’t like baking very much. Cupcakes (from a box mix) are basically the extent that I’m willing to go. So because of that, I will leave the amazing wedding cakes to the pros! But I wanted a geode dessert in my life. So I immediately thought that cupcakes would be the perfect opportunity for me. They are small and hard to mess up. And bonus! They are little and round on top which is exactly like a geode! 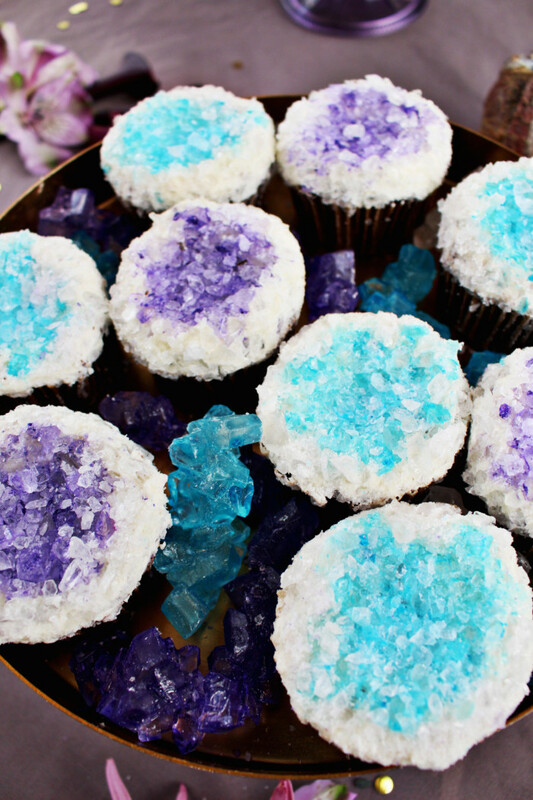 So I knew they’d be perfect for making some fancy geode-inspired treats and I knew I couldn’t even mess them up. 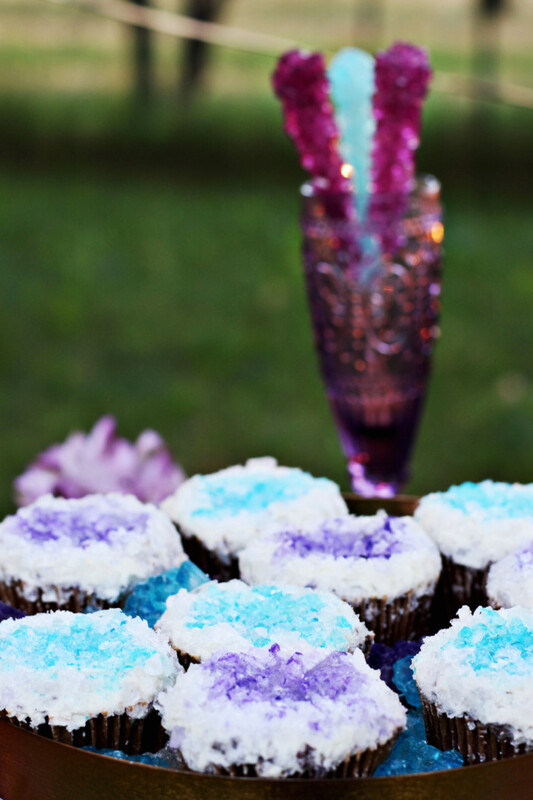 The glitzy topping is none other than simple rock candy. Doesn’t it look pretty all crushed up and sprinkled on a little cake? 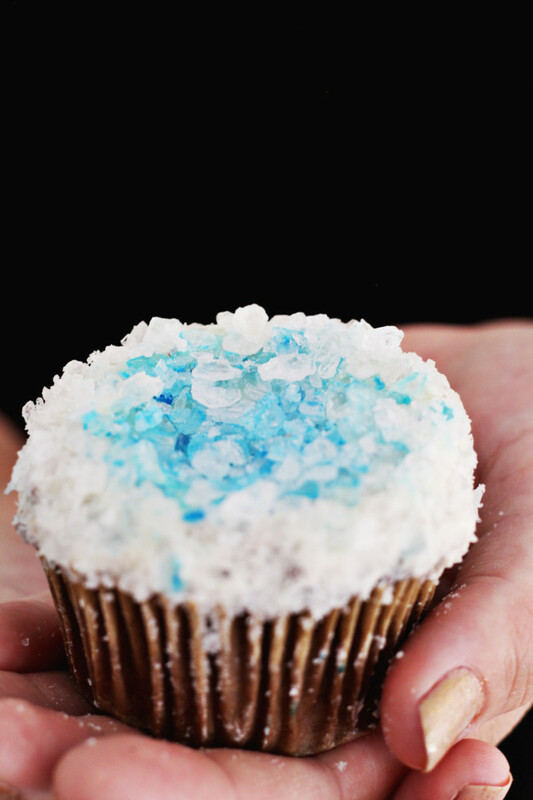 You could go a little more in depth and even make your own rock candy! That way you can get custom colors and probably save some money. 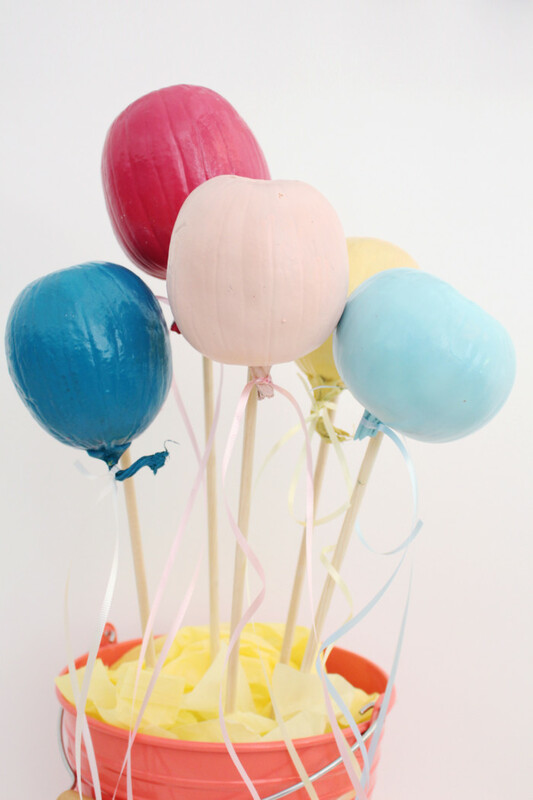 But I just used store-bought candy I found in the bins at Zurcher’s Party Store. Its pretty easy to find those rock candy suckers so if you don’t have a Zurcher’s don’t fret! Or, hop online and order some from a variety of retailers! Even though these look pretty fancy, they’re not only easy, they are perfect for children as well. Kids just love all that sugar crushed topping :) So grab a cupcake pan and head right here for the instructions! 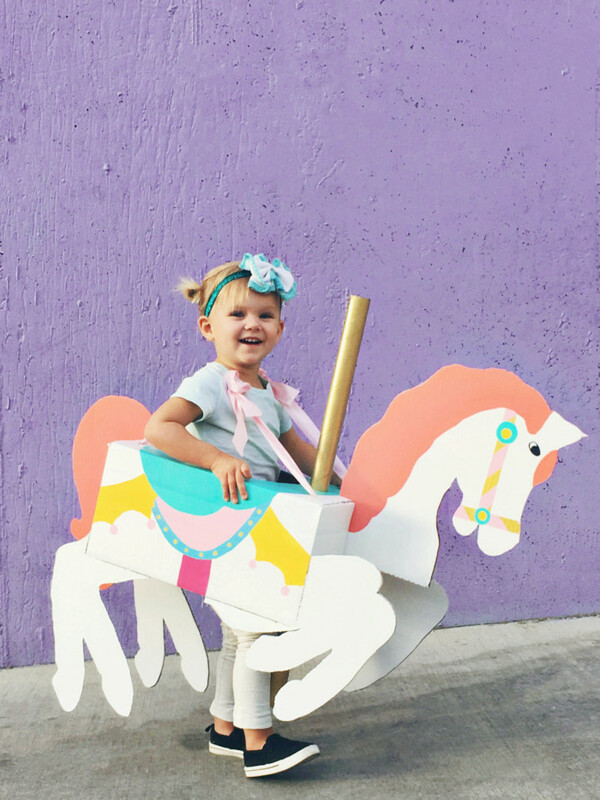 With a little paint and cardboard, a whimsical carousel horse costume can make all your child’s dreams come true! And for under $5, this costume is a win for parents too. My daughter’s favorite ride at any amusement park or carnival is definitely the carousel. She LOVES them! The first time I ever took her on one was in May, just before her second birthday. It was the carousel at the Washington DC zoo when we were visiting Malissa. The first expression on her face was amazing! As the carousel began to turn, she got a confused/concerned look. Not unhappy but there was a definite frown. Imagine a questioning frown with wide eyes and that’s the look. It was hilarious! But it only took her a second to decide it was awesome! 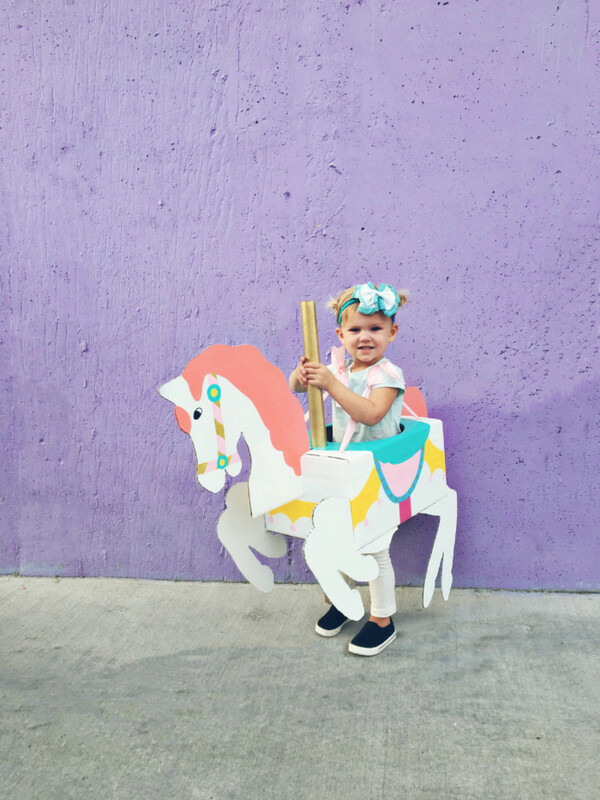 She quickly began to smile, laugh and say “wooo!” We got some really cute videos of that ride. And by the end she was crying and kicking when I took her off. Only distracting her with gummy worms made her okay with leaving that ride. Now, when she rides a carousel, the concern is gone. From the beginning, she is “woo”ing and laughing and smiling and waving. She wants to ride them over and over again. 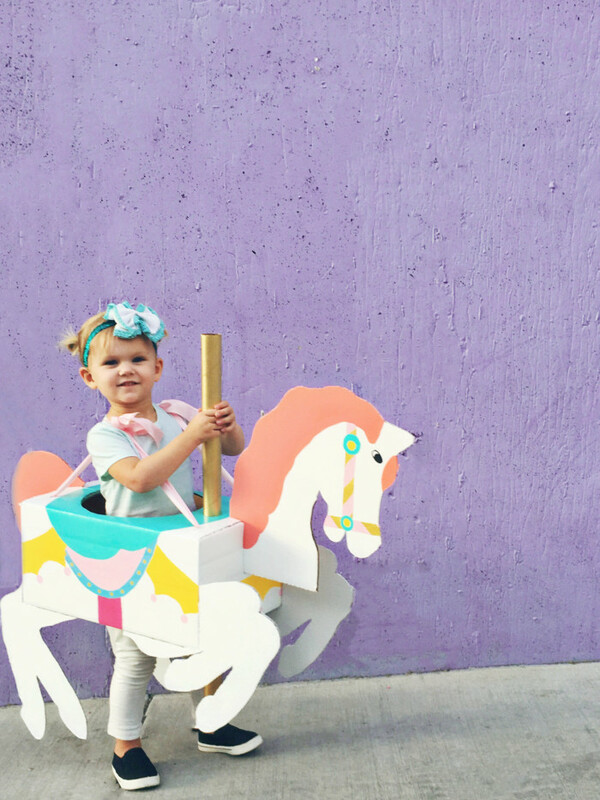 She runs to the carousel when we see one and can’t wait to choose her animal. I distinctly remember as a child the carousel being one of the only rides I ever wanted to ride. I was such a scaredy cat! Big rollercoasters terrified me and so did most of the small ones. But I remember loving the carousel. It was just so non-scary. No one else was ever too interested in riding it with me though. Except my mom. My mom was definitely my amusement park buddy. She always sat out of the “scary” rides to stay with me. She never complained about it or tried to push me into riding the ride. Having that support from my mom is always something I will remember, cherish and try to emulate as a parent. As I’ve gotten older and over some of my fears, I’ve still always loved the carousel. More now because of the aesthetics though. Aren’t they, like, the CUTEST ride!? No matter how many running-away/predator scenes they happen to make it into in the movies, I will always think they are adorable and completely non-threatening. They’re usually so ornate, with carvings and little scenes on the inner pillar. And all the animals are so dressed up! I wish more people put multi-colored saddles, ribbons and sashes on their horses! 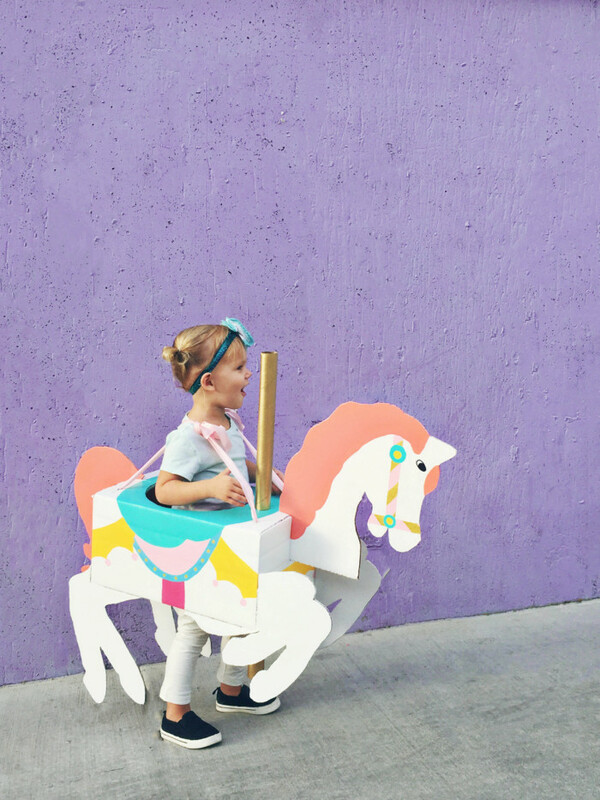 Anyway, with Stella and mine’s combined love of the ride, I decided it would be the perfect Halloween costume for her! Actually, truth be told, I started brainstorming this costume last Halloween, before I even knew how she felt about the ride. I always thought it would make such an adorable costume. My plan was always to have this be her costume this year. Having Stella actually love carousel horses was just a bonus! It took me a while to figure out a way to make this costume, I was brainstorming all kinds of ideas. Horse costumes usually aren’t very cute. Finally I decided to turn to my favorite crafting material, cardboard. And boy am I glad I did! Not only was this costume super easy to put together, it was incredibly forgiving AND it cost me less than $5. Even if you have none of the materials lying around for this costume, you’re looking at $10 tops. 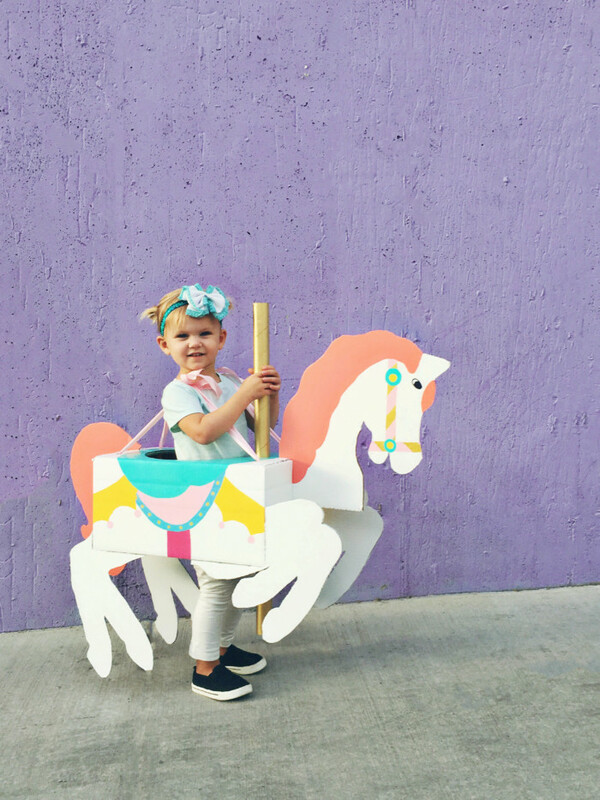 With costumes easily coming in at $40+, this one can be a lifesaver (at least a wallet-saver! ).